Viruses assumed to belong to a new Potyvirus were detected in passionfruit plants with foliar mosaic, leaf curl and fruit malformation that were collected from Akita City, Akita Prefecture in 2013, Nago City, Okinawa Prefecture in 2014, and Satsuma Town and Yoron Island, Kagoshima Prefecture in 2015. 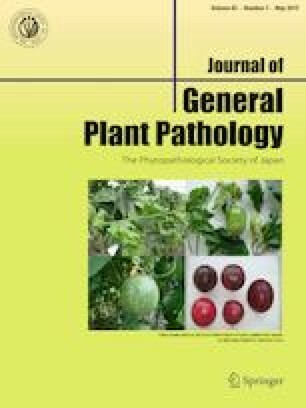 The isolates of this virus species were not detected by ELISA and RT-PCR targeting East Asian Passiflora virus (EAPV)-AO (Amami Oshima strain), which induces woodiness disease of passionfruit in Japan. The isolates were designated PV-AK (Akita), PV-OK (Okinawa), PV-YO (Yoron), and PV-SA (Satsuma). In a host-range test of 13 cultivars of French bean, four were systemically infected with the PV isolates and two with EAPV-AO. Cowpea cv. Kurodane sanjaku was systemically infected with PV isolates and induced mosaic symptoms on non-inoculated leaves distant from the inoculated leaves but was immune to EAPV-AO. The complete genomic sequences of the PV isolates consisted of 9973 nucleotides (nt) excluding the poly(A) tail, and encoded 3217 amino acids of polyprotein, flanked by 129–130 nt of the 5′-noncoding region and 193 nt of the 3′-noncoding region. Whole-genome nucleotide and amino acid sequences indicated that they belong to identical species. The potyvirus with the highest whole-genome nucleotide identity to the PV isolates is watermelon mosaic virus, which shares 68.1% identity, versus 65.3% for EAPV-AO. On the basis of ICTV-naming regulations, these PV isolates belong to a new species in the Potyvirus genus, but are distantly related to EAPV. Here, we propose East Asian Passiflora distortion virus as the new species name. The online version of this article ( https://doi.org/10.1007/s10327-019-00842-0) contains supplementary material, which is available to authorized users. The authors gratefully acknowledge Dr. E. W. Kitajima, University of Sao Paulo, Brazil, and the Genetic Resources Division, Central Agricultural Research Department (CARD), Hokkaido Research Organization (HRO), for providing the French bean seeds. We also acknowledge Dr. A. Shimada of the fruit horticulture laboratory at the Faculty of Agriculture, Kagoshima University, for useful information on the occurrence of viral diseases in passionfruit producing areas. This work was supported by a JSPS KAKENHI Grant number 16K07620 and by World Bank Funds regulated by the Indonesian Agency of Agriculture Research and Development (IAARD).